Corner of Brown Street and Power Street in College Hill. The corner is at the top of the little hill by the John Brown House. St. John’s Cathedral at 271 North Main Street, Providence. The United States is once again struggling through a national conversation about race, a discussion made more difficult by how little most of us know about our country’s history of slavery. Rhode Island may be our smallest state but nearly everyone from its wealthiest early citizens to its most recent antebellum immigrants helped the Ocean State become one of the US’s largest contributors to the international slave trade. How? We’ll discuss complicity and resistance from a variety of view points. Step into the roles of sailors, captains, barrel makers, chocolatiers, church bishops, insurance dealers, housewives, Quaker slave owners and Quaker abolitionists, enslaved Ghanians and indentured Irish. 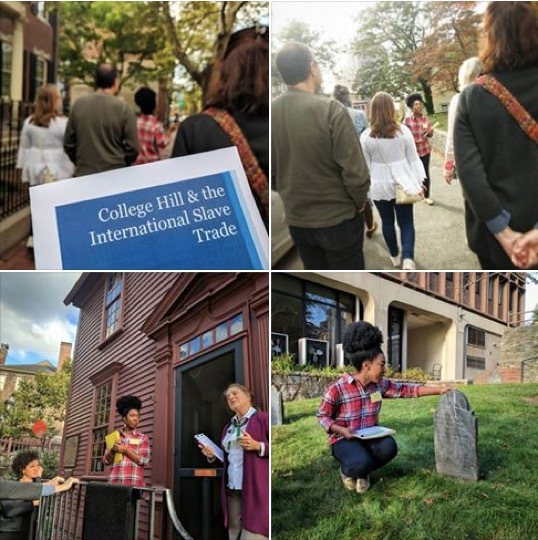 Take a hike through history and discover how College Hill created its wealth and stability, and helped lay the foundation for race relations in the state via human trafficking and forced labor. This walking tour covers more than 200 years of history in 2 hours. We will also cover about one mile of the neighborhood of College Hill. Stops include the John Brown House, Stephen Hopkins House, John Carter Brown Library, University Hall and the historic St. John’s Cathedral. While educational and engaging this is, at times, like an urban hike. The sidewalks are uneven, we cross a couple of busy streets and there is the occasional road construction. Please make sure you dress comfortably and bring water. The Walking Tour BEGINS at the corner of Brown Street and Power Street at the top of the little hill by the John Brown House. Elon Cook Lee is a museum activist and race womanist. She is the program director and curator for the Center for Reconciliation, and its slavery museum project. Elon leads workshops on interpretation theory, and slavery programs that center Black humanity. She is also a genealogist, public history lecturer at RISD, a Brown University educated public historian, and a National Association for Interpretation certified workshop developer and instructor (CIGT).